Last week marked the end of our Whole Foods / UF IFAS Family Nutrition Program 95210 Kids on the GO! campaign for the Fall 2015 semester. What began in Spring 2012 at two Title I elementary schools in Collier County, has been successfully implemented across 13 schools this past term. 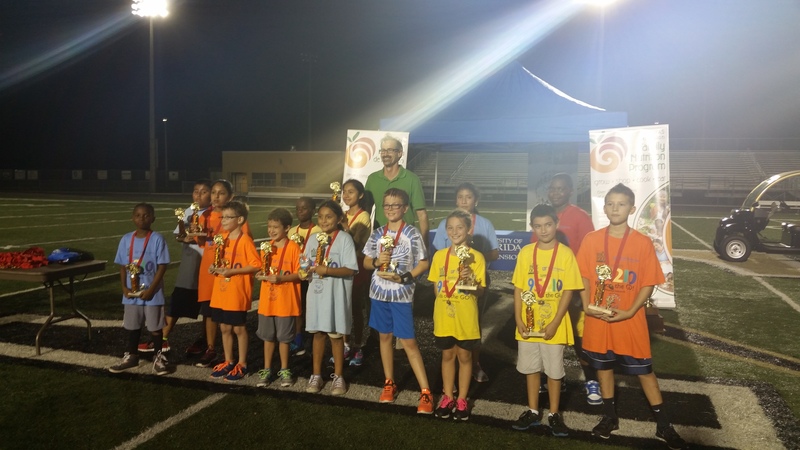 750 Collier students came out to run their cumulative “Final Mile” (of their 12 week marathon distance goal of 26.2 miles) at Immokalee High School on December 2nd and at Golden Gate High School on December 9th. This incredible program has now served over 3,850 children since its inception, and it would not be the success that it is today without the tremendous support of the University of Florida IFAS Extension Family Nutrition Program, Whole Foods, the Gobble Gobble Four Miler, Dr. Todd Vedder, the Florida Department of Health in Collier County, and of course Collier County Public Schools. As of right now, 95210 Kids on the GO! is slated to rollout across 22 county schools for the Spring 2015 semester! Stay tuned for more information regarding this growing initiative! On December 4th, the Coalition was honored to be named as a 2016 recipient of the FootPRINT Fund Award. Through the generosity of Allegra, this grant opportunity provides thousands of dollars of print services to over a dozen area nonprofits. We will be putting this gift to great use to create many of the drowning prevention materials that we hand out in the community at events and committee meetings. Recently, the Coalition has also received a donation from the Rusty Staub Foundation that we will be putting toward the purchase of over 300 door alarms to distribute to parents in need who live near pools and other bodies of water. Though door alarms are an integral layer of protection, we ask for all parents to still practice vigilant supervision, receive training in CPR / First-Aid, install a self-closing / self-latching fence, and to get their kids enrolled in swim lessons early and often. Tags: 95210 Kids on the Go!